Adjustable tailgate barrier to keep stuff from falling out of the back of the CJ or Wranglers when tailgate opens.Works well for Jeeps with tailgates removed as well. Includes 4 black MILSPEC PVC coated stainless steel rings, and powder coated black cam buckles on 18" adjustable webbing straps built onto the barrier. 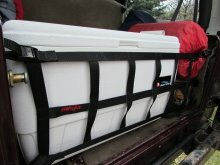 Barrier is about 11" high and 31" wide plus mounting straps. Comes with standard upper stainless footman set to mount on wheel well just behind tail lights or upgrade to our 4 piece stainless PVC coated mount system rated at 265PSI per corner for upgraded strength applications. Requires minimal drilling for a full OEM appearing installation. 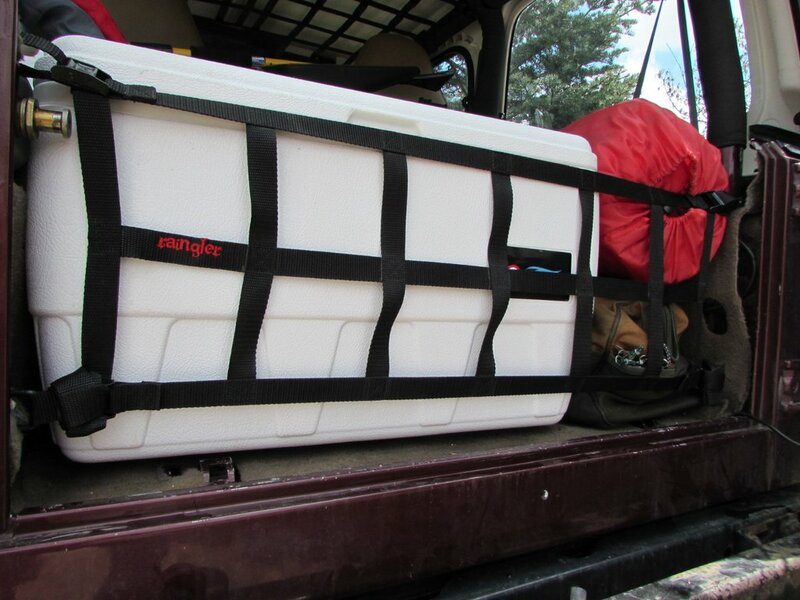 See our larger (16"X31") version for 2007 - newer JK models or for owners wanting a taller tailgate barrier.